So this week I’ve been spending about an hour or so every night on my sampler. Of course, I’ve also had to take out some stitches. 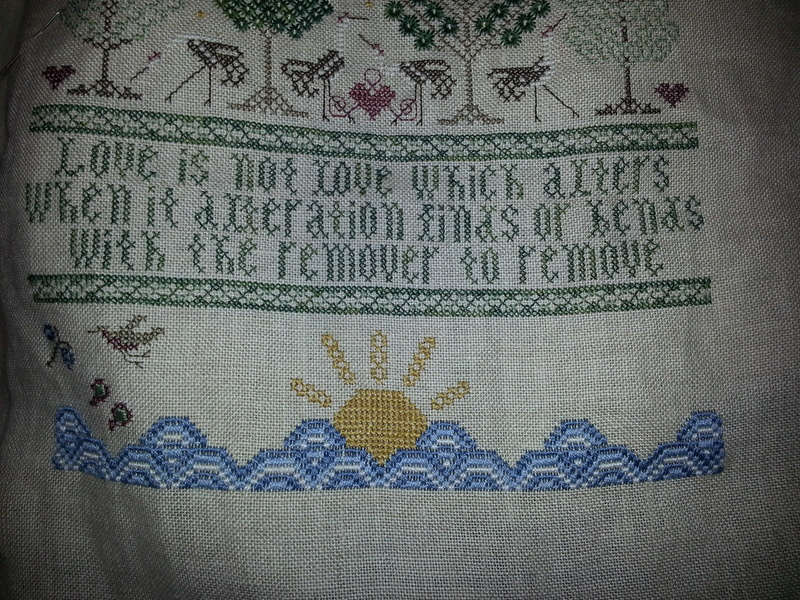 This particular sampler is worked on linen, which is my favorite fabric to cross stitch on. I love the homespun look and I think it looks more sophisticated than Aida cloth. Don’t get me wrong, I’ve worked pieces in Aida but that seems more appropriate for casual pieces. The advantage to linen is that it can be worked “in hand” which means without stretcher bars or hoops. It makes it much easier to manipulate the fabric. I also love the difference in texture of the threads, some are thicker than others. 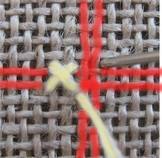 You would think it might be difficult to stitch “over two” but here is a photo showing how it’s done. This is a photo of stitching on Aida. Here’s a close up of what I’ve accomplished since last week. Remember when I posted the first portion of this bargello-type stitching? Now the whole row is completed as well as the sun motif. Here is the entire row. Now, these were photos taken in my living room at night with my Samsung phone. Does anyone have any tips of taking better photos? Or better yet, a simple way to make them all the same size? I’m not sure what I’m doing. I don’t have a camera nor do I want to purchase one. I like the ease of using my camera phone. Perhaps taking them during the day? Feel free to drop me a line with any tips or tricks! This entry was posted in Needlework, sewing, Stash Bash. Bookmark the permalink. I’m so glad you stopped by to visit me blog this week. Thanks to Tricia and the Stash Bash! 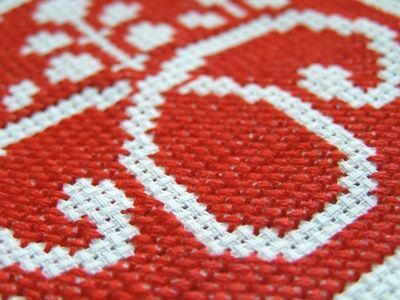 I love your cross stitch. I’ve long admired this work, but have yet to try my hand at it. I do have some suggestions for taking pictures with your phone – since that’s what I did until just recently! Take your pictures in the daytime in the room in your house with the most natural light. I bought a big piece of white fiber board to lay my work on and use as a back ground. It was inexpensive and I just prop in behind the door when I’m not using it. With some practice you’ll be a photo wiz!